Oh what the heck. You just know I can't resist making something from perfectly good wood... and cedar at that! I had quite a few scraps left over from building the garden arbor; actually most of it came from me changing my design plan after construction had begun which required me to purchase an additional length of cedar. Anyway, it looked like I would have enough wood left over to build a trellis. Oh Joy! 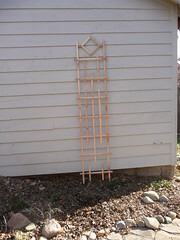 I had an idea of what I wanted it to look like and after Google searching trellis images I found a trellis that was pretty darn close in an article at Associated Content:Making an Old-Fashioned Garden Trellis for Mom on Mother's Day , but of course I modified it a bit to meet my needs and of course use the pieces that I had on hand as effectively as possible; I didn't follow the written directions but rather used the picture as a guide. I did mess up at one point in what I was visualising, but it all worked out in the end. And thus another project was began! The design concept was simple and the biggest challenge was to keep everything evenly spaced. So there was a lot of calculating and use of spacers. Here's a real quick description. These are pieces left over from building the Garden Arbor. So I decided to make a trellis out of it. With the verticals lined up and set next to each other I marked where the horizontals would go. I made some spacers to help keep everything straight. I'm about to glue my first horizontal across the verticals. This is the photo I was using as a reference.